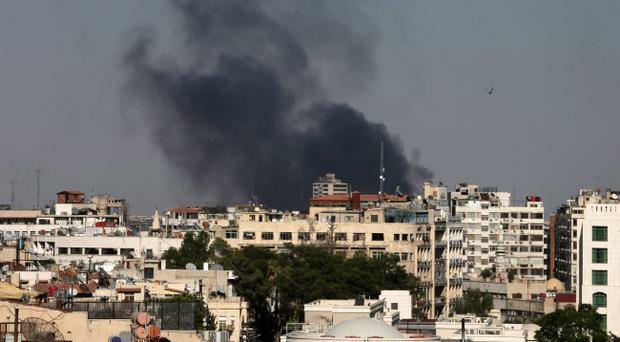 Black columns of smoke rise from heavy shelling in the Jobar neighborhood, east of Damascus, Syria, Sunday, Aug. 25, 2013. The British government is accused of “breathtaking laxity” in its arms controls after it emerged that officials authorised the export to Syria of two chemicals capable of being used to make a nerve agent such as sarin a year ago. The Business Secretary, Vince Cable, will on Monday be asked by MPs to explain why a British company was granted export licences for the dual-use substances for six months in 2012 while Syria’s civil war was raging and concern was rife that the regime could use chemical weapons on its own people. The disclosure of the licences for potassium fluoride and sodium fluoride, which can both be used as precursor chemicals in the manufacture of nerve gas, came as the US Secretary of State John Kerry said the United States had evidence that sarin gas was used in last month’s atrocity in Damascus. He said: “This would seem to be a case of breath-taking laxity – the Government has had a very lucky escape indeed that these chemicals were not sent to Syria. The licences for the two chemicals were granted on 17 and 18 January last year for “use in industrial processes” after being assessed by Department for Business officials to judge if “there was a clear risk that they might be used for internal repression or be diverted for such an end”, according to the letter sent by Mr Cable to the arms controls committee. Mr Cable’s department last night insisted it was satisfied that the export licence was correctly granted. A spokesman said: “The UK Government operates one of the most rigorous arms export control regimes in the world. August 27, 2013 -- The United States is repositioning naval forces in the Mediterranean, Red Sea, and Gulf as it considers a possible military response to an alleged chemical weapons attack near the Syrian capital, Damascus, that killed hundreds. French and British forces in the region could also be involved in any attack. Graphic shows military buildup around Syria and likely targets in Damascus.